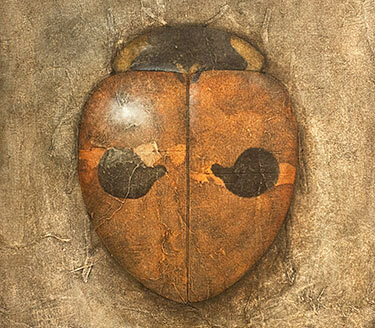 This section features a series of lady beetle paintings. These appeared in various venues, starting with my sabbatical exhibition at Naropa University in 2012, followed by a large solo show at the Denver Botanic Gardens, and an invitational solo exhibition at the Garrison Institute in Garrison, New York. A number of these are still on view at the Art + Soul Gallery in Boulder, Colorado. I'm interested in series and sets as a compositional method: these beetles are all of the same formal (one might even say formulaic) composition. The paintings make use of cut-out canvas silhouettes for each beetle shape and multiple layers of paint, cheesecloth, and modelling paste leaving a surface that appears to have been ravaged by some weird blend of neglect, affection, and the softening effect of time. As noted in the captions, there is a wide range of sizes in this series.